The first post in the Wixie training series focuses on ensuring that teachers have a clear idea of why to use Wixie and what students can do with it. The next step is to make them comfortable with the tools in Wixie that allow students to create these projects. or using one of the tutorials in the training library. To begin using the authoring tools in Wixie, have teachers log in to their Wixie accounts. At the Wixie dashboard, click the New button to launch the authoring tools. If they haven't created any Wixie projects yet, Wixie will open to a blank page. While the blank canvas is one of the most powerful things about Wixie, it is easier for new users to get started with a little direction. The Wixie templates can help. Click the Projects button on the Wixie toolbar. At the Projects View, click the Templates tab. This library includes templates like trading cards, wanted posters, ID cards, and timelines. The Templates library also includes entire folders filled with All About Me ideas and graphic organizers. a bio poem and print a copy for students to take home to read with their family members. The files in the Templates library are always accessible to students, so learning what and where they are can help you initiate conversations about potential classroom projects. After teachers have made their first project with a template, share and brainstorm additional ideas for getting students started using the Templates library. Wixie includes a library of training materials, including step-by-step tutorials. Show teachers how students will access these materials by having participants click the Wixie button on the tool bar and choosing Help. This will open a new browser tab with a link to a Wixie tutorial at the top. Wixie actually includes three different tutorials leveled for a range of users. To access all the tutorials, go to the Wixie button and choose Home. Click the Training button at the top of the Wixie teacher dashboard. You will see reading level radio buttons on the right. Click a different radio button to see the different tutorials. These are leveled by both reading and technical ability. Level 1 is great for new computer users, and you can use level 3 with teachers who are comfortable using technology tools. Download and print copies of the tutorials, so participants don't have to move between windows or tabs on their device. Have participants choose the level they would like to use and follow the step-by-step instructions to make their first project on their own. Instead of telling everyone in the room to do the same thing at the same time, this allows you to walk around the room providing additional support to participants who are not as comfortable with technology, while power users have a support that will help them explore the tools and options more thoroughly. Explore these ideas for moving from tutorials to classroom projects so you can share projects that teachers can do with their students using the same skills learned in the tutorials. No matter how you choose to introduce and guide teachers in their first experience with the Wixie authoring tools, try to make their work in Wixie fun and relevant to their future classroom experience. If teachers have never used Wixie with students, they won't have existing student work to view, but you will definitely want to demonstrate this powerful Wixie feature. Go to your teacher dashboard and click the Students link on the toolbar. Use the pull-down to choose the class whose work you want to view and then choose a student in the list to see their projects. Click an individual project and use the player buttons to hear any audio in the file and view each page in a multi-page project. What are some of your favorite ideas for introducing Wixie to teachers? Please share your experiences in the comments. 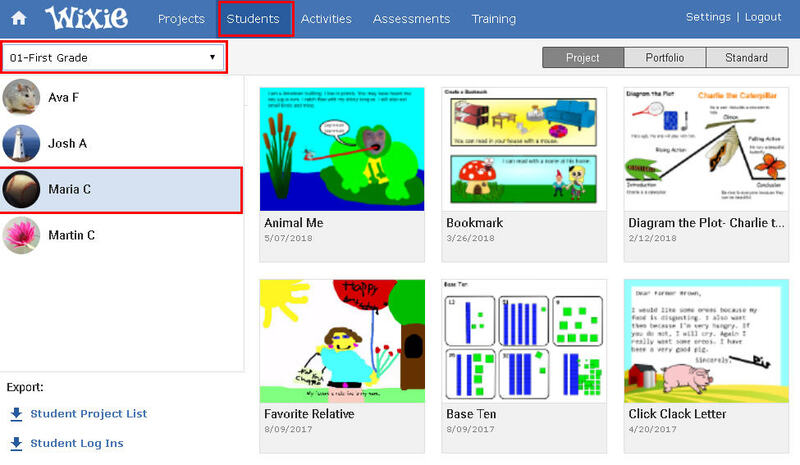 *The next blog post talks about exploring the Wixie Curriculum Activities and assigning projects to students.